The benefit of teaching a dog to heel is that you can actually take your dog for a walk, rather than letting it take YOU for a walk. Heel is another command that gives you more control. Let's face it - it can be dangerous and downright embarrassing to be dragged along the street by an out of control dog. What's The Benefit of Teaching a Dog To Heel? Peaceful, hassle-free walks are the first major benefit that springs to mind. It's just plain annoying when your dog keeps running forward, looping back, and stopping to sniff every second lamp post when you're out for a walk. Teaching a dog to heel can also help to keep the situation under control when you meet other dogs on your walks. For excitable and impulsive dogs like Jack Russells, learning to heel is a must. As with all dog training, there's more than one way to do this. This is a simple way that anyone can use. It's best to start preparing your dog for the Heel command at home in your back yard, before introducing it to the outside world with all its distractions. The proper way to hold the lead when you walk the dog is in your right hand, with the lead across the front of your body so that the dog is walking on your left. With your dog on the lead, get it to Sit beside you. Start to move off in a straight line and encourage your dog to follow with a gentle pull on the lead and the use of its name. When it comes forward, reward and praise. After it becomes comfortable with the action, start to introduce the verbal "Heel" command while it's walking beside you. First, let's deal with a dog that keeps charging forward. 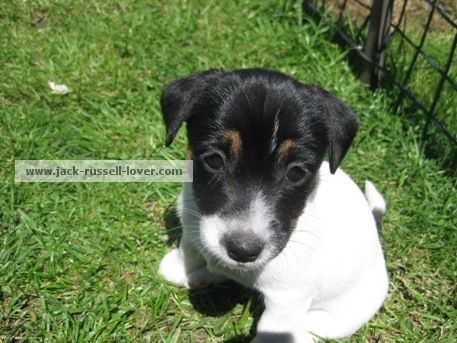 This is more typical with Jack Russells as they want to explore everything. When you go for walks and you want to teach the Heel command, take some tasty dog treats with you. When the dog starts to charge forward and tug at the leash, stop walking. This takes away the dog's freedom to explore and move. Make eye contact when your dog looks at you. Keep walking and use the Heel command. Reward it when it complies, then start walking again. If it ignores the command, more basic training at home is needed. Repetition of this pattern will start to make the dog understand that charging ahead will result in a loss of freedom, and it's better to keep pace with you. What about a dog that's reluctant to follow? Again, start the training at home. Lure the dog forward with treats, and associate the movement to a reward and a verbal command. Use the command when it is showing the desired action, and reward immediately after. Regular collars and leashes don't really give you much control over your dog. There are an assortment of different leashes available now that make dog-walking control a lot easier. Just because your dog can heel, doesn't mean you should let it walk off the lead alongside you on the street. Many an owner has lost a little friend because of overconfidence in how well-trained the dog was. Always keep free running for safe areas only. Need more help with basic obedience? 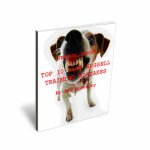 The Top Ten Jack Russell Training Mistakes is a free special report designed to help you avoid the common pitfalls.